Most people only think in terms of IP addresses assigned to a computer. With the help of the Arp command, IP addresses are translated to MAC addresses which, in turn, allow the machine to speak to the network. Your MAC address is set by the manufacturer. In this article I am going to show you a very handy GTK tool that allows you to change that MAC address. Get past a MAC filtering device. Sniffing connections on a network. Obfuscate the manufacturer-created MAC address. Many reasons people change MAC addresses are less-than-friendly. I am, in no way, advocating such acts. I only show this tool for those reasons that are, as we say, "above board". For example. I have, only rarely, seen an instance where somehow the MAC address of a built-in network card was the same as the MAC address of a router. Because of this that machine was unable to get online. There were two ways around this: Purchase a new NIC or change the MAC address of the built-in NIC. For the latter reason, I took advantage of MACchanger-GTK. Search for "macchanger" (no quotes). Select MACchanger-GTK for installation (this will pick up any requirements necessary). That's it. 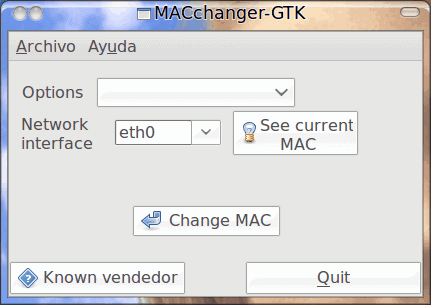 You are ready to use MACchanger-GTK. 1. Select your Network Interface from the drop down. 2. Click See current MAC (this will display your address in a new window). 3. Click the Known vendor button. If your NIC is detected with enough information you can then change the address to another address of the same manufacturer. If not, your best bet is to go with Random. 4. From the Options drop down select one of the methods for changing your address. That will change the MAC address of your network interface card. Once changed you can then click the Quit button to dismiss the MACchanger-Gtk window. I can't stress enough that this tool should only be used for legitimate, legal reasons. Do not attempt to use MACchanger-GTK for any purpose that would land you in trouble. And, should you do so, Ghacks or the author is not, in any way, responsible for your actions. On those occasions that you do need to change a MAC address (for the right reasons) it's good to know you have a simple GUI tool in Linux to do the job. Any similar tool for XP? Mac changer or any related tool should never be used in any circumstance. The default MAC address is just enough. Anyway, this tool must be run under the root user, if in any case, the tool is needed. TO JK III: Download the source code and compile or port it under Windows. Being able to have anonymous MAC address may be useful at the local Burger Joint or Cafe. The article below provides further insight and highlights how your MAC address could well become a unique virtual number plate, automatically identifying and recording everywhere one goes on the super highway. Plus the last article on using VPN services also shows how they may not be as anonymous as assumed. What’s more, internet addresses that use the new protocol by default contain a 64-bit string that’s generated by a computer’s MAC, or Media Access Control, address. The use of the so-called extended unique identifier means that people who want to remain anonymous online will have to take precautions that aren’t necessary under today’s IPv4 system. “It means that everything you send or receive is labeled with your real MAC address and therefore if you were to do something naughty, like download copyrighted material, they would know who you are much better than they do if all they have is an IP version 4 address,” Bowne said. and for those for have been downloading files via what they thought as anonymous encrypted VPV services, need to know that there computer could have been leaking the users real IP address via the IPv6 protocol. Well this is one reason to change a MAC address, spy Ruskies take note. ‘Samy worm’ writer publishes proof-of-concept that gleans home router GPS coordinates…via MAC address and Google maps….